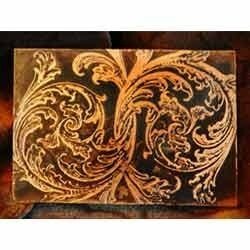 Photo Etching Service in Vadodara,Gujarat,India We have established ourselves as the leading enterprises actively committed towards providing Photo Etching Service. to our patrons. The photo etching process, also known as chemical milling, basically consists of controlled removal of metal particles through a combined chemical and physical action. Starting from a drawing that describes a customer’s design, a photo tool is generated by CAD software, and the negative of the shape of the part is impressed by light exposure on a thin photo-sensitive film, which is attached to both sides of a metal sheet. For providing this service, our experts use the latest techniques and tools to offer up-to-date painting service to our patrons. Apart from this, our prestigious clients can avail this service from us at a rock bottom price. VMC Precision Job Work in Vadodara,Gujarat,India We offer our precious clients an excellent quality VMC Precision Job Work service. To perform this service, we have a special team of highly experienced professionals who help us to meet the specific requirements of our precious clients. We make sure our valuable clients that while rendering this service, our professionals only use the finest grade machines and modern technology. Moreover, our service is highly acknowledged by our clients owing to its perfect execution and cost-effectiveness features. Photo Chemical Etching Services in vadodara,Gujarat,India We have established ourselves as the leading enterprises actively committed towards providing Photo Chemical Etching Services. to our patrons. The photo etching process, also known as chemical milling, basically consists of controlled removal of metal particles through a combined chemical and physical action. Starting from a drawing that describes a customer’s design, a photo tool is generated by CAD software, and the negative of the shape of the part is impressed by light exposure on a thin photo-sensitive film, which is attached to both sides of a metal sheet. For providing this service, our experts use the latest techniques and tools to offer up-to-date painting service to our patrons. Apart from this, our prestigious clients can avail this service from us at a rock bottom price. Die Polishing Service in vadodara,Gujarat,India As an eminent enterprise, we are offering Die Polishing Service to our valuable clients. This service is timely executed by our highly qualified professionals using high grade machines and advanced technology. The provided service is highly applicable in number of industries where different types of dies are manufactured. We offer this service as per the requirements of our clients within scheduled time-frame. Clients can avail this service from us at affordable price. Further, our offered service is highly demanded by our clients for its flawlessness and promptness. Mold Die Polishing Service in vadodara With highly driven ethnically excellence, our organization is actively committed to offer the qualitative grade Mold Die Polishing Service. The offered service is carried out by our adept professionals using excellent grade machines and superior technology. We offer this service in an excellent manner within a scheduled time frame. Owing to its promptness and flawlessness, this service is widely appreciated by our clients. Further, we provide this service as per the varied requirements of our valuable clients at most reasonable price.